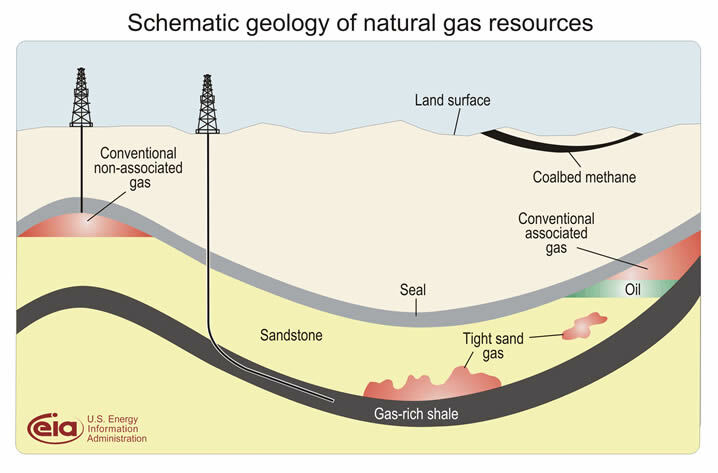 The UK government has invented novel definitions of what is meant by unconventional hydrocarbon resources and hydraulic fracturing (‘fracking’). Their effect is to make life a lot simpler for the fracking companies. But although the definitions ostensibly have the force of law, in that they have to be acknowledged in the Minerals Development plans being drawn up all over the country, they bear little or no relation to how the terms are understood, either in the science of geology or in the hydrocarbon exploration industry. They therefore need to be challenged in law. 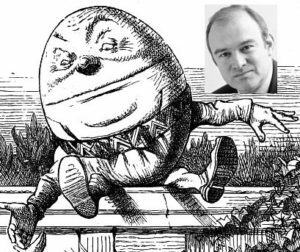 Sir Ed Davey was Secretary of State for Energy and Climate Change (DECC) 2012-2015 during the period when the coalition government formulated its novel definition of unconventional hydrocarbon resources. “The question is,” said Humpty Dumpty, “which is to be master—that’s all.” [Through the Looking-Glass, and What Alice Found There, by Lewis Carroll, 1871]. I have submitted a detailed critique of the definitions to the now-closed consultation calling for comments on the Minerals Local Plan of West Sussex County Council. I show that the definitions are legally weak or inconsistent, and neither based on rational nor up-to-date science. Although my comments are intended for WSCC, they are equally valid for other county councils which may be in the throes of drawing up minerals plans. Here is a summary. 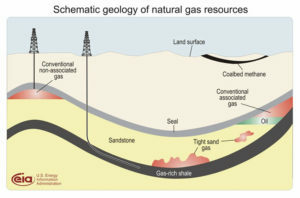 This attempt to define the difference between conventional and unconventional hydrocarbons conflates the mineral itself (“hydrocarbons“) with the process (“comes from“) and the supposed source or reservoir rock. The difference beween the two terms is fundamentally one of resource extraction method. The guidance fails to recognise this point. It uses overly-simplistic rock types to differentiate between the two resources – “sandstone“, “limestone“, “shale“, “coal seams” – without defining them properly. Such nomenclature is too black and white; in practice, there are gradations between end-member rock types; for example, geologists can describe a muddy sandstone, a sandy limestone, or a sand-prone shale. The end-members themselves, for example, 100% pure limestone, are rather rare in nature. There is no mention of the geological context within which any of these rock types occur, for example, basin position, trap geometry, layer thickness, etc., nor the source where the hydrocarbons have been generated. There is no mention of the physical properties of the rock types, such as permeability and porosity. It omits mention of the physical and chemical properties of the “hydrocarbons“ themselves, e.g. viscosity, API gravity (oil), or alkane (gas). It omits to mention the processes by which the hydrocarbon is extracted, in particular the difference between hydrocarbons which are extracted from the rock with little or no treatment, versus those requiring extensive treatment to make them flow – e.g. steam heating, acidising, or hydraulic fracturing, or whatever forms of reservoir stimulation. There is no mention of the economic aspects of the production process. I have written to the Department of Communities and Local Government asking for the information to justify its definition, but await a reply. There is no universally agreed definition of the difference between conventional and unconventional hydrocarbon mineral extraction; various versions in the scientific and technical literature emphasize different aspects mentioned in points 1-6 above. However, all reasonable definitions that I am aware of include, either implicitly or explicitly, the permeability of the host rock. The figure of 0.1 mD (milliDarcies) for the host rock is generally agreed to differentiate between the two extraction procedures. Next in importance to a quantitative definition using permeability comes the geological setting in which the hydrocarbon-bearing rock occurs. Thus conventional resources are found in finite and well-defined traps, whereas unconventional gas or oil is distributed throughout a widespread layer with no clear-cut boundaries. Along with the two criteria above, the process of extracting the hydrocarbons is important. It is variously described as fracking, acidising, massive stimulation, additional extraction or conversion technology, or assertive recovery solution. Although different in detail, what they all have in common is the aim of making the hydrocarbon flow when it would otherwise not do so. No definitions of which I am aware (see the links and references in my WSCC submission) regard so-called “sandstone” or “limestone” reservoirs as automatically conventional, as DECC has defined. On the contrary, many sandstone and limestone reservoirs are called ‘tight’ (see the diagram above), meaning that unconventional extraction methods are required. DECC’s specious definition, complete with its faulty grammar, reminds me of what I might find in a poor undergraduate essay on the subject, were I still teaching. This would not matter, except for the fact that it appears to have been concocted to enable unconventional oil development in the Weald (inter alia) to proceed without even the minimal extra checks and safeguards of UK legislation on unconventional hydrocarbon development. Weakness 2: the word “expected” (quoted twice). The first weakness is that the phrase in question is almost meaningless. Does it mean that the strata referred to which are not composed of shale, have to lie in direct contact with shale, above, below and all round on all sides? The phrase is unclear. The second weakness, the expectation of a specified threshold volume of fluid, implies a belief that a certain amount will or will not be used. The question arises; who is doing the ‘believing’, and what happens if the expectation that less than the specified amount turns out to be incorrect? The process of hydraulic fracturing involves the insertion of fluid into rock at depth. The volume being inserted is both continuously monitored and controlled by the operator at the surface. Now it may be the case during any one fracking stage, for which planning approval has been granted on the basis that the process will not fall under the definition of ‘associated hydraulic fracturing of shale’, that the operator may decide to insert a greater volume than specified by the threshold. That action implies that the planning consent has been wilfully breached. The alternative, which is under the complete control of the operator, is merely to turn off the fluid supply valve before the threshold is exceeded. This freedom of action applies both for any one stage and for the last stage at which the total threshold of 10,000 is in danger of being breached. In conclusion, I can see no justification for someone’s belief to be inserted here as part of a legal definition. It implies a discretion on the part of the operator, of whether or not to abide by the planning consent. Such a weak phrasing of the definition may therefore be open to challenge. The definition involves the specification of two alternative minimum fluid volume measures, without qualification. The scanty research upon which it is based, comprising merely a literature review by consultants for the EU in 2012, has been superseded by a thorough US Geological Survey (USGS) continent-wide study of fracking water volume use, and discussed below. Two questions arise from this definition by water volume; (a) whether fracking can be soundly defined by such a criterion, and (b) even if this be the case, whether the quoted threshold values are based on sound evidence. The US Geological Survey (USGS) survey of water volume use involved over a quarter of a million fracked oil and gas wells. Because the wells have all been fracked, they are, by any reasonable definition, unconventional. The results show that high-volume fracked horizontal shale wells can be definitively separated from the lower volume wells (predominantly for tight oil or gas) by any figure of between 2500 and 7000 cubic metres for gas, and 1700 to 2500 cubic metres for oil. So if one wished to choose one number to differentiate between high volume hydraulic fracking and other hydraulic fracking, then a figure of 2500 cubic metres would be appropriate. Edinburgh University fracking researchers have drawn attention to the unreasonable Infrastructure Act definition, and suggest that strain rate may prove to be a better criterion than simply fluid volume; this is a measure of how fast the rock cracks up when fracked, and involves the applied fluid pressure and the rate of flow, as well as the total volume. But they question why such a definition is needed at all. They also pointed out that under the UK definition, almost a half of the gas wells and nearly 90% of the oil wells which were hydraulically fractured in the USA over this decade would now not be classified as ‘fracked’. So if the definitions remain unchallenged, the small-time unconventional oil developers now eying up the Weald could develop it by fracking, but as long as they keep an eye on their fracking fluid volume use, it won’t be classed as fracking. This in turn opens up the supposed protected areas, such as National Parks and Areas of Outstanding Natural Beauty, to wholesale fracking as well. Fracking remains fracking, whatever specious definitions are used to try to airbrush it away, if it artificially enhances permeability in rock. This basic fact applies whether the method used is (a) fluid under high pressure or (b) dissolution by acids. Fracking type (a) is hydraulic fracturing; fracking type (b) is chemical fracturing. Both types of artificial permeability enhancement fall under the umbrella of ‘unconventional’ fossil fuel exploitation. In conclusion, the definitions in the planning practice guidance and the Infrastructure Act of 2015 have no scientific justification, and should therefore not be considered as legally binding on county councils. They can and should be challenged in law. Sir Humpty should be ashamed of himself. A more detailed and referenced version of this blog is here.